Eggs are nature’s perfect food; they’re a rich source of protein, fat, and important nutrients like B vitamins and choline. Egg yolks are chock full of nutrients. Egg whites, on the other hand, contain over half the protein content of the egg, but contain less vitamins and minerals, compared to egg yolks. For a time, people were scared to eats eggs because they were worried about consuming too much saturated fat and cholesterol. However, we now know dietary cholesterol has little impact on cholesterol levels in our blood. So, go ahead — eat up nature’s most nutritious creation! Blue bars show the typical range in grams for a Paleo meal. For example, a Paleo meal usually includes 30-60 grams of fat, but where you personally fall in that range will depend on your preference. Orange dots show how 1 egg fits into the typical nutrient profile of a Paleo meal. Deciphering the label on egg cartons can be both confusing and misleading. You’ll often find “cage-free”, “free-range”, “pastured”, “organic” or “omega-3 enriched” on any given egg carton. While these terms sound favorable toward the health of a chicken, often they are not. For example, the term “cage-free” does not require chickens to have access to an outdoor space, and it’s possible they are confined to an indoor space all the time. YOLK: Big, brightly-colored yolks are a sign of a healthy chicken and egg. If a chicken’s diet is healthy and it was pecking away at plants and insects, the yolk will be a darker, almost-orange color. However, if the chicken ate corn or a less nutrient-rich diet, the yolk will be lighter in color. EGG WHITE: A healthy egg white should be thick and cloudy. 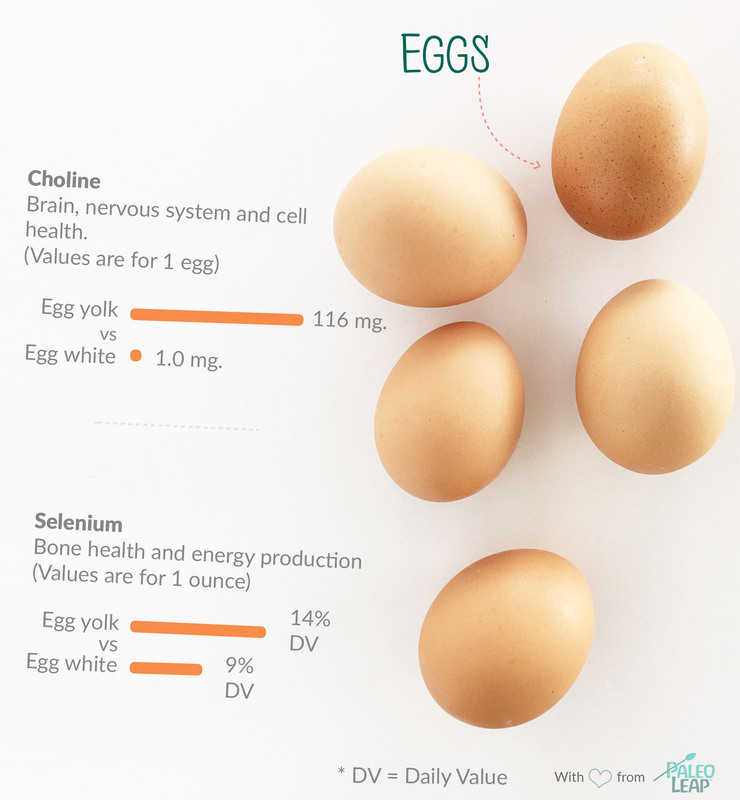 The egg white contains much of the protein, but not as many nutrients as an egg yolk. FARM-FRESH: Confused by all the different labels on an egg carton? Know how the chickens were raised and fed by buying your eggs directly from a farmer, or better yet, raise your own! Hard-boiled eggs are a protein-packed snack. Slice them up and top with a bit of salt, or eat them plain. Make a veggie and sausage-filled frittata or casserole. Bring a pot of water to a simmer, then slip eggs into the water and allow to simmer for 2-4 minutes. Remove with a slotted spoon. Serve with hollandaise sauce. Fry, scramble or make a meat & veggie-filled omelette.